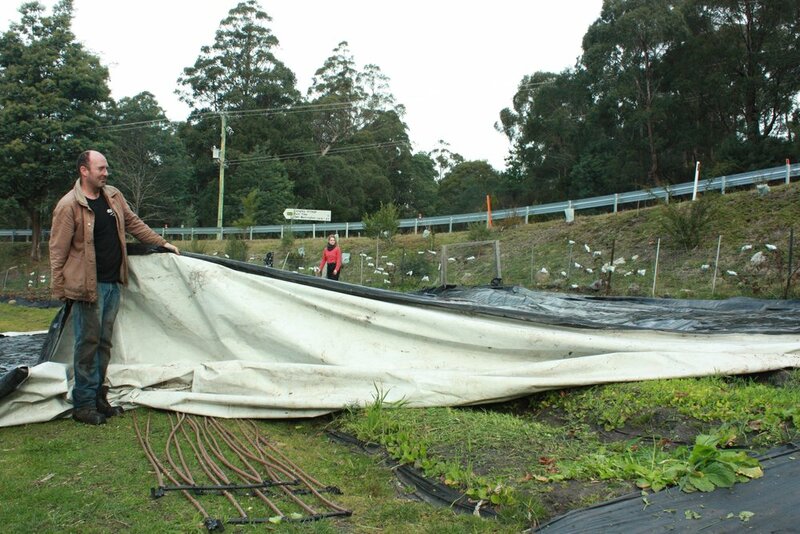 We use covers as part of our growing strategy, different covers are used for the growing season, for soil cover or for pest cover as well as during winter dormancy or after cover cropping. Weedmat, ACO reg. input “Weed Gunnel”. Depending on the crop we use a registered weed mat (best used with dripline irrigation) for some of our permabeds during the growing season. These crops include tomatoes, eggplant, zucchini, cucumbers, squash, basil, capsicum, garlic, leek, cauliflower, broccoli, cabbage, large leaf kales. As our permabeds are all 15 metres in length, we are able to reuse the weed mat with holes cut for particular crop spacings, as part of our crop rotation. The mat will last us several seasons depending how much care we take with it. As this non woven geotextile is made from first use polypropylene it can be recycled. I want to stress the point that we use this ACO registered mat in order to maintain 110 beds with commercial viability. 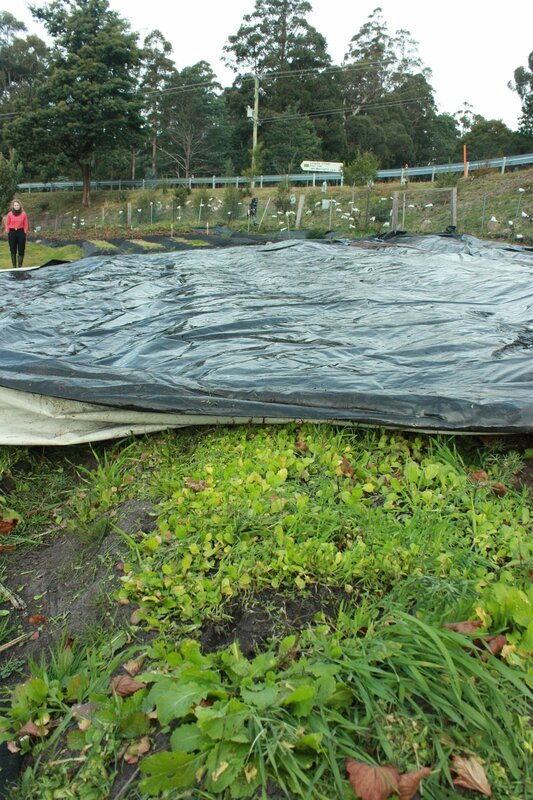 The advantages we get from the mat cover are protected soil surface for moisture and microbes, increased bed warming while plants are not big enough to blanket shade ie, during the cooler months as well as obvious weed suppression. ‘Weed Gunnel’ , registered organic farm input, weed mat, 1400mm width will cover a 750-800mm wide permabed and 2/3 of the paths either side. Also 500mm width for paths. Pins for weedmat and dripline. We pin our weedmat every two metres on the path edge and also alongthe centre of the bed, similarly we pin the irrigation lines every two metres, using one pin for each dripline. Many of our 15metre permabeds have 4 or 5 driplines therefore it is possible for a permabed to require 50 pins. We have 110 permabeds. Often you will be taking out the pins to reprepare, replant or rotate beds, to this end we attach ten litre buckets with holes in the base to the fence at the ends of each permabed zone, allowing easy storage and access to the pins. Effective frost and cabbage moth protection, best used with dripline irrigation, cloche is available in different diameters, I have made the mistake of getting two metre wide cloche to cover broccoli etc in our 800mm wide beds, it is not quite wide enough as it needs to sit over hoops and then across the path gully so it can be weighted down with sandbags or river rocks. The weedmat pins wont work with cloche as it is too fragile.. Its fairly cheap. Silage pit cover,(post green manure/cover crop). Originally designed as apit cover for conventional agriculture, This food grade u.v stabilized film is completely light blocking anddesigned with supporting microbial development in mind. Please note. After removal and before intensive planting a weed management strategy should be adopted such as ‘stale bedding‘.